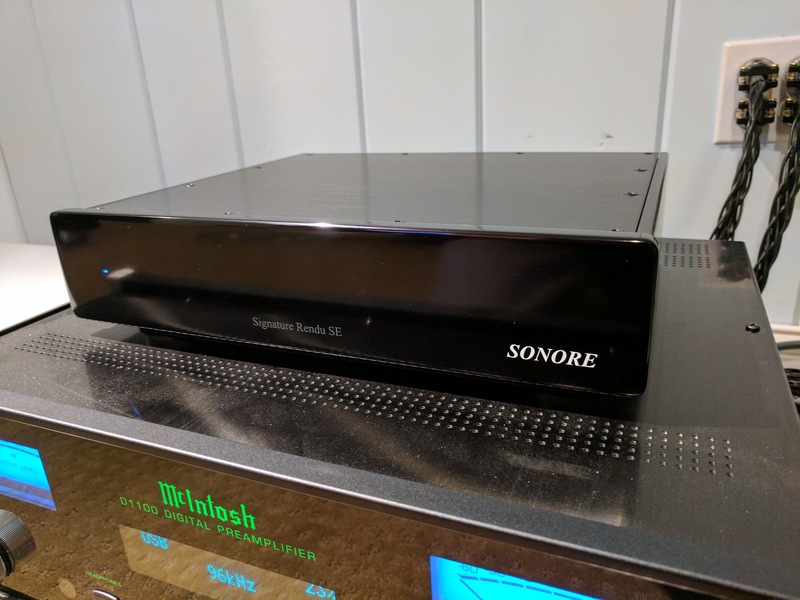 Last year I reviewed the original version of networked audio streamer, Sonore microRendu. Recently someone offered to loan me the newest version 1.4 to test and measure. So here are the results. The Sonore microRendu is a super light, tiny aluminum box, requiring external power to operate. The device is too light to support the weight of the cables attached to it and runs super hot. I don't recall the original version running this warm. I can barely keep my hand on it for a few seconds. The microRendu comes with support for Roon which is the way I tested it. For external power, I tested it with iFi iPower power supply ($50), UpTone LPS-1 and my Lab Power supply. Roon recognized the device after a minute of so of being powered on and reliability was good. So as a way to network a DAC and remotely using it from your computer or NAS device, it works fine. Retail price is $650 which is quite high. You can easily buy a computer for the same price although probably not a silent one. And this price does not include a power supply. For DAC, I picked the iFi iDAC2 again. The iFi is USB powered and retails for $350 DAC. For reference, I tested the DAC directly connected to my PC and then compared it to Sonore microRendu driving the same. As a way of comparison, since I still have the SOtM SMS-200 networked audio player (see: http://www.audiosciencereview.com/f...d-review-of-sotm-sms-200-network-player.1846/) I compared its results to that unit (which retails for $200 less). As noted on the graph, the results are essentially identical. You can choose to use USB direct (from a laptop as I did) or use either the microRendu or SMS-200 and get the same performance. We see fair amount of degradation in both networked players. Mains related leakage is evident as are additional distortion spikes. This means both devices are pretty sensitive to quality of power feeding them. If you do not want to see such degradation, you need to use them with quality linear power supply. Note however that these degradations are far more disturbing to the eye than the ear. Their levels are extremely low and very unlikely to be an audible concern. Testing with UpTone LPS-1 supercapacitor supply did ease the pain but as shown in my review of that product, unless a linear power supply is still used with it, you are going to get more mains leakage than not using any of these devices. From functionality point of view, the Sonore microRendu works fine as a reliable Roon endpoint. On performance front, the only way to avoid degradation of (measured) DAC performance is to use a linear power supply. That makes the Sonore microRendu even more expensive. The SOtM SMS-200 provides an excellent alternative here. It is $200 cheaper, and built far better. It has a solid enclosure and the engineering inside is just excellent. If you need a remote networked audio streamer, my recommendation is to go with SMS-200 with a linear power supply (or decent switchmode). As always, comments, feedback, jokes, etc. are welcome. Amir, I think you got the price wrong. You can't buy the microRendu with 1.4. The newer one still sells with 1.3. If someone want to get the 1.4, they need to buy the 1.3 and then upgrade to 1.4 for an additional $245. God knows why but that's how it works. I have never seen any manufacturer doing such stupid selling policy. 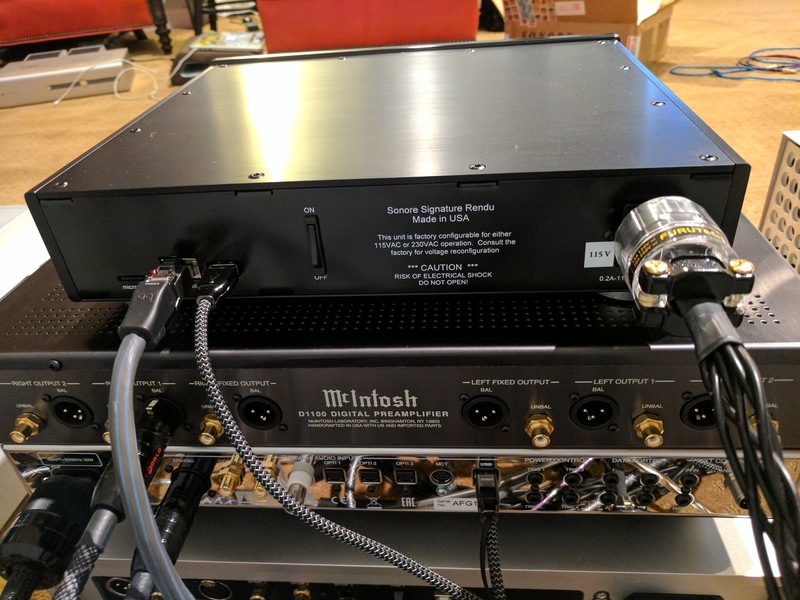 Recently Schiit had their Gen 5 USB board upgrades but all their new DAC comes with the upgrade. microRendu 1.3 ($640) + 1.4 upgrade ($245) = $885 is the actual cost. Dig those crazy power cords! It is indeed a fail. I think it is DIY cable. Connector is by Furutech. I looked at their site and they don't show any such cable. But of course they sell the connector. Yellow is the reference which is the iFi DAC2 powered and driven directly from my laptop (a good option as a replacement for this class of device). Red is iFi iDAC2 this time driven by LPS-1 which in turn is powered by my Lap supply. Performance remains the same as using hardwired USB connection. Magenta is the same except that the LPS-1 is powered by the recommended MeanWell switchmode power supply by Uptone. As seen before, this combination leaks AC mains noise and that shows up through microRendu as well as it did with ISO regen. 1. These devices do NOT reduce noise output of the DAC. At best, they equal it. So please do not buy them as a digital tweak. They still have computers in them and at any rate, even this low cost $350 DAC is immune to them. 2. Powered intermediate devices like this can be an additional source of mains leakage which is a common occurrence in low-cost switchmode supplies. To get emissions certifications, the output of these supplies is connected to input using "Y capacitors" which in turn leak AC mains in forward direction. Once there, it travels through the DAC and your amplifier. 3. Powered by linear supplies, you remove the mains leakage (assuming the linear supply doesn't have leakage of its own). So that negative contribution is taken away. 4. I see no value in LPS-1. Powering these devices directly by linear power supply generates the best performance matching hardwired USB connection. Save your money there and put it toward music, food, etc. 5. As a functional category, i.e. remoting the connection of a DAC, these streamers have value and you should only buy them for that reason. Consider also using quiet PCs next to your DAC as that has shown consistently good performance in my testing (both desktop and laptop). One hardware bug I have found while testing the microRendu v1.4: it lacks a proper power-on reset circuit. If I turn on my linear supply the device will not power on. I have to turn on the linear supply first and then plug it into microRendu. Proper design calls for a "power good" or "power supervisory" circuit that keeps the processor reset until the voltage is high enough to assure proper operation. It costs next to nothing to implement this so I am surprised it is not in there. Another aggravation is the SD card. Half the time when I plug in the USB cable, I push the SD card causing it to come out. The device stays operational but will not work as the OS is on the SD card. Perils of making the device too small for no good reason. Great portal, Amir, lots of unbiased reports, no marketing BS, just objective data from direct measurements. Very educational, especially for a newbie like myself. Thank you very much, and please keep your excellent work. You noted "... Consider also using quiet PCs next to your DAC as that has shown consistently good performance in my testing (both desktop and laptop)." Would you extend the same recommendation to a Mac? Any measurable differences in USB DAC's output in case of Mac mini vs. MacBook (factors: internal vs. external PSU, proximity of the screen...) running the same soft, and under the same CPU load? Internal HDD vs. internal SSD (differences in EMI/RFI levels, maybe)? Another part of the equation - the DAC. In the context of our discussion, could you please comment on the importance of the DAC having asynchronous USB input featuring galvanic isolation (via transformers, probably)? And last, but not least, is there a DAC ticking all the relevant boxes, and under $400 - $500 you could please recommend? Welcome to the forum. That is one cool avatar! I bought a MacBook a year or more ago just for this kind of testing but not being a Mac guy, I have not yet done anything with it. I will measure it at some point. I don't have a Mac Mini but I can purchase that to measure too. No. Almost none of the DACs I have tested care what the PC is doing, much less what disk/SSD technology they have. And there is no way to tell which has lower EMI/RFI anyway without measurements. For quietness and long term reliability I would use an SSD anyway. I always like to see this. Currently that DAC is the Topping DX7. Alas, no sooner than I reviewed it last month that I found out it is being replaced by DX7s. I have the DX7s but have not yet reviewed it. There is high demand for it so I should be able to get to it in the next 7 days or so. So stay tuned. Welcome, Shalom, you are lucky as you will now learn that there are great sounding dacs for so little $$. They are measured and so they sound! Your Macs will all sound the same also, there is no differences as the dac will handle all comers and give bit perfect output. DAC stands for digital to analogue converter, they are meant to be transparent, re ‘transports’ as long as they deliver bit perfect output I have never heard any differences. How can that be bit-perfect? I think it may be something new, just invented. A scientific breakthrough. BTW: I was referring to the transports. The above is a joke for some of the more militant scientists here. Congratulations on your trolling .. I think thats all your here for, if I’m not convinced otherwise by you next few posts then you will find yourself not being able to log in anymore. Not at all! Can't disagree, can't agree can't have a conversation without being abused. Rather dishonest actually! Just replying to you, if you want it private send a private message please. You made it public. There is no place that bullies people with different HONEST opinions more than here! To be fair being a Schiit fanboy can’t be easy. Iv no intrest in seeing you ridicule members especially New members who maybe be at a technical disadvantage but here with honest intent . I don’t care what you think about the righteousness of subjective audition vs measurement etc , I picked all my hifi by the way it sounded to me so please don’t play that card. These are public warnings ( that’s why they are red). As you have nothing to add relating to the op and seem hell bent on derailing the thread Iv issued a reply ban.